Dr. Anna Cherrie Epps is the only African-American woman with a Ph.D. to become dean of a U.S. medical school. When veteran academician Dr. Anna Cherrie Epps took on a challenging new role this fall, she shattered the proverbial “glass ceiling” on several fronts. 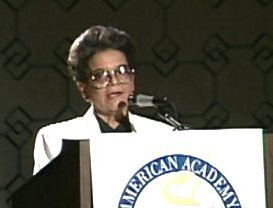 As the new president and chief executive officer of Meharry Medical College, Epps not only became the first woman to lead one of the nation’s major independent medical colleges, but she is also believed to be the first person of her age to take on such a position, at the age of 83. Epps has been part of Meharry’s administration in one capacity or another since 1994. She was vice president and dean of the School of Medicine from 1997 to 2002, according to Meharry. Epps is the only African-American woman with a Ph.D. to become dean of a U.S. medical school. She had also served as vice president for academic affairs and professor of internal medicine at the college. Epps had been serving as interim president of Meharry since May when then-president Dr. Wayne Riley abruptly took a leave of absence after losing the support of his board leadership. Epps was quietly appointed Meharry president in September after Riley resigned. Over the span of her career, Epps has accumulated considerable firepower and experience, all of which observers say she will need in helping Meharry tackle its future challenges. Her background includes having considerable knowledge about the accreditation processes of the Liaison Committee on Medical Education and the Southern Association of Colleges and Schools. She is an emeritus member of the Georgetown University Board of Regents. With 61 years being the average age of college presidents nationally, as determined in 2011 by the American Council on Education, Epps is part of a small cadre of veteran academicians who are zipping past traditional retirement time. They are responding to calls to stay in the game, their knowledge and skills warranting it. They are stepping forward amid the rapid turnover of presidents in the last five years and the trend toward much younger leaders with business and social media savvy. “They are bright and committed,” says Xavier University of Louisiana President Dr. Norman Francis about the young crowd of presidents emerging on the horizon. “But there’s something about the wisdom of old age and impatience of youth,” adds Francis, himself, age 83. As president of Xavier for 45 years, Francis still puts in full days, and colleagues say he has a memory like a fox. What keeps experienced, senior academic leaders in the increasingly tough game of higher education leadership may puzzle some younger people, seniors say. For them, the reasons are pretty simple. “This is not just a job for me,” says Hampton University President William Harvey, 72, who has been chief of the private liberal arts institution in Virginia for 35 years. “It’s a way of life,” he says, noting his work keeps him learning something new every day and keeps him on his toes. Dr. Frank Pogue, 75, president of Grambling State University in Louisiana and an academic leader for 51 years, concurs. “The experience itself is helpful. I don’t know a young person who could survive here [at Grambling] for a year or two,” says Pogue, noting that Grambling has faced unprecedented challenges over the last three years from seeing its state budget cut in half to staff cuts and program reductions. “We aren’t working for the money,” Pogue says of his senior peers. Pogue, who has served as president of colleges in New York and Pennsylvania and, after retirement, served as interim president of Chicago State University and Grambling before becoming its president three years ago, says the demands of the current job have tapped into all he has learned in his previous assignments. “I used to look at people like me and kept asking why do these people come back,” says Dr. Eddie N. Moore Jr., who came out of presidential retirement in response to special appeals to work with financially troubled institutions, first St. Paul’s College in Virginia and more recently as interim president of Norfolk State University. “I still feel I have the right set of skills and ability for the challenges Norfolk State faces now,” says Moore, 65, explaining why he decided to relinquish the relaxing life of retirement for the demanding challenges of being a college chief executive. Moore previously served as president of Virginia State University from 1993 to 2010. Prior to that, he served as comptroller for accounting and reporting for the College of William and Mary, as well as head of the Virginia Department of the Treasury under then-Gov. L. Douglas Wilder. There are some other reasons for staying in the game, notes Dr. Belle S. Wheelan, president of the Southern Association of Colleges and Schools Commission on Colleges. She adds that working longer, particularly in a career you like, gives seniors time to rebuild their savings. In addition, Wheelan says her generation of “baby boomers” grew up in a “work ethic” era in which “normalcy was getting up in the morning and doing work. Also, doing nothing doesn’t appeal to us,” she adds, referring to people nearing or at retirement age who have no taste for not working as long as they can contribute. Wheelan and others say another benefit of having senior and experienced education leaders on board in senior posts is that the group of leaders is seasoned. Francis, who has toned down his traditional 24/7 schedule a little, says he still finds his math skills from his earlier years as valuable today in the era of high tech computers and spread sheets. When sorting through voluminous computer-driven budget documents and spreadsheets, he will find some error traceable to improper use of fractions, he says. If the machine doesn’t do the math, most young people don’t know anything about fractions, he says with a chuckle. Moore, who says don’t expect him to keep pace with all the young people on his campus, counts social media as one of the communication trends that he is in no hurry to catch up with. He says that he’s looked at the pros and cons of social media, and the risk of private messages being easily accessed by unauthorized people is among the concerns he has about embracing social media. “I’ve decided I’m going to let young people have that,” he says.